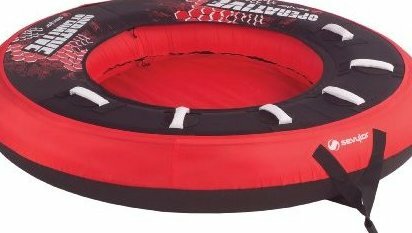 Versatile, inflatable towable for riding behind a motor boat--offers 4 riding positions. Quickly change between bronco, sit-in, disc, and chair positions for maximum fun. 70-inch diameter platform; 2-person capacity. 6 handles with neoprene knuckle guards. Double-Lock Fast Valve prevents accidental air loss and ensures quick, easy inflation/deflation.